The Taj Mahal, temples and tigers � experience all the spice of India on this 15-day tour. See the Taj Mahal bathed in the light of sunrise. Embark on an evening cruise across Lake Pichola. Enjoy magnificent views of the Jag Mandir Palace. Participate in a yoga class, a cooking demonstration, bindi tying, even get a henna tattoo! See the City Palace in Jaipur. Experience two game drives in Ranthambore National Park. Visit the site of Buddha�s first sermon. Take an early morning ride on the holy River Ganges. Welcome to Delhi, India�s capital city that sports a rich history spanning over 2,000 years. Ease your way into the local culture as your tour manager shares a few key phrases of the native language. Enjoy a sightseeing tour of Old Delhi. Visit Jama Masjid, India�s largest mosque. Explore Old Delhi�s narrow streets by rickshaw, the traditional mode of transportation. Next you�ll tour New Delhi, visiting Qutub Minar, the tallest brick minaret in the world. Then, visit Humayun's tomb � considered a precursor to the Taj Mahal for its Indo-Persian design; it was built by the widow of a great Mughal Emperor. Behold the India Gate war memorial, the Parliament and the palatial Rashtrapati Bhawan � the President's residence. Participate in a relaxing yoga class and learn basic exercises and breathing techniques from a local expert. Visit the exquisite City Palace. Its main entrance, Tripolia, was built in 1725. Stop at Sahelion-ki-Bari, the Garden of the Maids of Honour, and learn about the lifestyle of the royal ladies who once strolled through these gardens. This evening we cruise along Lake Pichola and take in views of the Jag Mandir Palace and the City Palace. 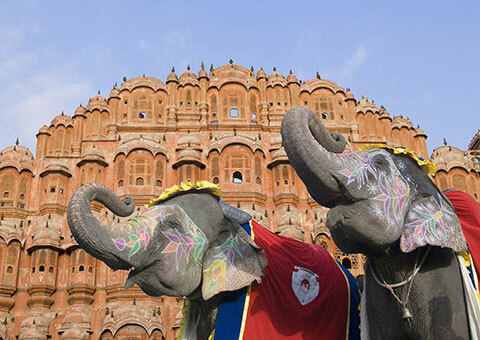 This morning, depart on a scenic drive through the countryside to the �Pink City� of Jaipur. After having lunch and checking into your hotel, head out for a brief stop at Hawa Mahal, home to a former Maharaja, beholding its fa�ade of 953 windows. Visit the City Palace, finding gardens, courtyards, intricate decorative art and carved doorways. Marvel at Jantar Mantar, an astronomical observatory built in 1726 by Sawai Jai Singh. Ride an elephant* to the top of Amber Fort, India�s former seat of power. Visit a local school** where the children are part of a mid-day program supported by the efforts of Collette Cares. Tap into local customs during lunch as you learn about turban and sari tying. Stroll through a flower market for a glimpse into the art of making garlands used in traditional Indian welcome ceremonies. Enjoy a henna tattoo and bindi demonstration. Sit down tonight for a home-hosted dinner, observing daily life inside the old city. Travel to Ranthambore National Park, learning of Project Tiger's efforts at conservation in the country. A naturalist discusses the wildlife of the country and presents a slideshow. Embark on a game viewing drive by canter, an open air vehicle. Watch for marsh crocodiles, hyenas, sloth bears and even tigers. Rise and shine early for a game viewing drive. Afterwards, enjoy breakfast at your hotel. Visit the Ranthambore School of Art which recruits students from neighboring villages and trains them to be self-sufficient artists. Next, visit Dastkar Ranthambore Project, founded in 1981 by six women united to protect India�s traditional artisans. Dive into the local cuisine with an interactive cooking demonstration followed by dinner. An early morning train brings you to Bharatpur. Disembark and enjoy brunch before continuing your journey to Agra, a city rich with the splendors of the past. Visit the Taj Mahal at sunrise aboard a tonga � or horse carriage � that takes you to its gates. The Taj Mahal took 22 years and 20,000 men to build. Built in the 17th century by Mughal Emperor Shah Jahan as an expression of his love for his wife Mumtaz Mahal, the Taj Mahal is truly one of the wonders of the world. Visit Agra Fort, the seat of the Mughal Empire. Visit the Chandel Temple complex and behold some of the finest examples of temple architecture in northern India. Fly to Varanasi, a simplistic and charming city with a universal mystique. Tonight, visit the Ghats � the banks of the river � witnessing the illuminated Ganga Aarti ceremony. Cruise along the River Ganges past various Ghats where we see people ritually cleansing themselves of their sins, hoping for salvation. A city tour of Varanasi includes the Benaras Hindu University and Bharat Mata Temple. Continue to Sarnath where Siddarth Gautama, later known as Buddha, gave his first sermon on a quiet grove in the 6th century BC. A Hindu scholar discusses the philosophy of Hinduism with you. Join your fellow travellers for a farewell dinner this evening. Enjoy a morning at leisure before flying back to Delhi. Later, depart for your flight home. Experience two game drives in Ranthambore National Park. Spend two nights in Varanasi, India�s holiest city. Visit the 180-year-old Al Fahidi Fort, which today houses the Dubai Museum. Be whisked away on a 4-wheel drive into the golden sand dunes of Arabia. Enjoy an Arabic evening at a Bedouin campsite including a belly dance performance. See Patan Durban Square comprised of palace buildings, courtyards and temples. Explore Kasthmandap, a wooden temple built from a single tree. Discover Boudnath, a sacred place to Buddhist pilgrims from Tibet. Visit the sacred Pashupatinath Temple the most important Hindu temple in Nepal. India is 9.30 hours ahead of Eastern Standard Time. The currency in India is the Rupee. Voltage in India is 230V. Plug type is C and D.